The 1 oz silver coin in the Proof Silver Mexican Libertad collection is not only the best-selling version of the collectible coin, it is also the longest-running coin in the proof range. Introduced at first in 1983, the 1 oz Proof Silver Libertad has enjoyed annual production runs in every year dating back to 1986. Today, 2019 1 oz Proof Silver Mexican Libertad Coins are available to you online at Silver.com. Available to ship inside of protective capsules from the Mexican Mint! 34th year for the 1 oz Proof Silver Mexican Libertad coin! Obverse bears the design of Winged Victory. Reverse includes the image of the national coat of arms for Mexico. Backed by Banco de Mexico. The first issue of the 1 oz Proof Silver Mexican Libertad coin came in 1983 when just 998 coins were struck in this weight. It would be another three years before the coins arrived as an annual issue with the 1986 introduction of the Proof Silver Libertad. From 1986 to 1991, only the 1 oz Proof Silver Libertad was issued. It holds the record for the highest singular mintage in the proof series at 30,006 coins in 1986. In fact, it has two of the three highest mintages ever recorded in the proof range of Silver Mexican Libertad coins. The 1 oz Proof Silver Libertad, like the other weights, has gone through periods of minting-to-demand and set caps. The 2018 coins were capped at 10,000 in total. All of these 2019 1 oz Proof Silver Mexican Libertad Coins are available to purchase inside of protective capsules. The proof coins in this series offer brilliant visual contrast through the use of frosted design elements and mirrored background fields. 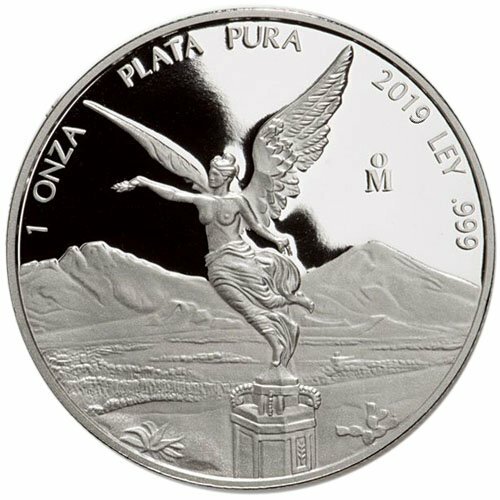 The obverse of 2019 Proof Silver Mexican Libertad Coins come with the image of Winged Victory emblazoned in the center. The background field includes the image of the distant volcanic peaks known as Popocatepetl and Iztaccihuatl. Engravings on this side include the weight, purity, metal content, and a mint mark. On the reverse of 2019 1 oz Proof Silver Mexican Libertad Coins is a design you’ll only find on the 1 oz and larger coins in this series. The modern coat of arms for Mexico is featured in the center of the design field. The design elements don’t stop there as they do on the fractional coins through. Around the modern design are 10 historic versions of the same seal used since 1821. Please feel free to reach out to Silver.com if you have questions about silver for sale. Our customer service team is available to you at 888-989-7223, online through our live chat, and via our email address.